We’ve recently made some big changes here at Lander. We want to introduce all of you to our new 30 day Free Trial Mode. Ok, so you’ve read this and you’re asking yourself: what exactly does this mean? Well, it means that we’re leaving behind our previous freemium model and adopting a new 30 day Free Trial mode on all plans. So from now on if you want to create a new Lander account you’ll have the option to sign up for any of our paid plans. Afterwards, depending on whichever plan you choose, you’ll then have 30 days to try out all of the Features that your particular plan offers. During this trial we won’t charge you at all, and there’s no need to use you credit card, because we won’t ask for it! After your 30 days are completed If you like Lander and want to continue, you’ll then need to upgrade your current plan or choose a larger ( or smaller ) plan. This will also apply if your free trial expired on your current plan, or if you reach your monthly visitor limit. But don’t forget, you can of course cancel at any time! Like we said above, just choose any plan that you want to use for free, and you can start testing that plans features for 30 days with no commitments. Whether you choose the Starter plan or our Pro plan (worth $130/mo.) just select the one that’s right for you and start testing all of that plans features. We also want to bring your attention to a new subscription plan, the Starter Plan. This new paid plan allows you to have 500 visitors per month plus one custom domain, all for just 9$ a month. Browse through our pricing and find out which plan best fits your immediate marketing campaign goals. Of course, as we said before, you can cancel at any time! No need to worry, just try all of Lander’s features and if you’re still not convinced you can just cancel whenever you want. Since we won’t ask for your credit card information, there’s no commitment and we won’t charge you a dime. Forget about any silly calendar alerts or reminders, just enjoy your plan and upgrade or cancel whenever you want! So... What Happen After my Free Trials Expires? Ok, if your Free Trial expires, your account will then be transferred to our Read Only mode. This mode will still allow you to enter into your account and access the entire platform just like before. You’ll still be able to check all of your stats, download any leads from your Landing Pages and even perform edits or create new landing pages. However, none of your Landing Pages will be able to be published live. In other words, your Landing Pages aren't going to be viewable online, nor will any of your visitors be able to see them either. 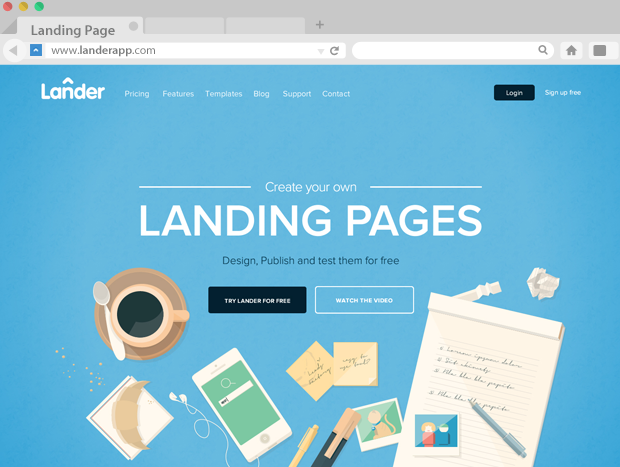 So, to publish your landing pages you’ll need to upgrade to the current plan, or choose a smaller or bigger plan. One other important note. If your plans are to set up any PPC campaigns, Facebook Ads or any kind of email marketing campaigns, you’ll still be able to create landing pages beforehand while in Read Only mode. Why is this so important? Well, this way you’ll be ahead of the game and have your landing pages ready for launch when you do the upgrade. After upgrading you’ll be able to publish those landing pages, set up custom domains, point the PPC ads and integrate your favorite email marketing apps. If you still have any doubts about Lander’s Read Only mode, please visit this post that explain in full detail how the read only mode works. During your Free Trial if you exceed your visitors limit your account will then be transferred to Read Only mode and your Landing Pages will be unpublished. However, even if your account is in Read Only mode, at any time you can still choose to upgrade and your Landing Pages will be up and running again in no time flat! Hey I'm Already Using Lander, What Happens With Me? For those of you who are already using lander, you’re probably wondering what’s next? Well, if you haven’t been able to check your email inbox yet, we want to tell you that we've officially upgraded your account for free! Ok, so you’re like.. what!? No problem, just let us explain. We’re giving all of our amazing current users a special 60 day extended free trial of the new Starter Plan (a new subscription plan starting at just $9 a month). This means that you’ll still have your 500 monthly visitors just like you have right now. However, as an added plus, you’ll now also have access to 1 custom domain for free until the 60 day free trial expires! So, the big news is that as of today, you've officially begun using Lander’s new Starter Plan absolutely for free. Please, if you still have any doubts, just visit this post to understand in detail exactly how you’re extended 60 day free trial works. If you've visited our website recently, you may have noticed that we've also made a HUGE change in the look and functionality of our Website. We could go on and on and explain to you more about it, but why don’t you just have a look with your own eyes! Check out the new look here. Please if you have even the slightest inkling of a doubt about our new Free Trial mode or Read Only mode, extended free trials, or whatever, please contact us at support@landerapp.com and our team will be more than happy to help you with any questions that you might have. Also remember to stop by and visit our Lander help center where you can also find some posts and new information about this new business model or about our app.